Thin liquid films, generated by the ISG*, produce high heat transfer coefficients. Handles viscous and scaling products. Energy input may be from many sources including an option for vapour recompression. Multiple effect systems reduce energy input. Capital cost is typically as much as 30% less than equivalent evaporators. Footprint is reduced by as much as 90% over comparative evaporators. Recovery and reuse of de-mineralized water from process or waste streams. Concentration of dilute products or wastes for reuse. Anywhere where oil or other non-soluble products are handled or stored. Was incorporated in 1996 and has always provided specialist equipment and services to many industries throughout the world. 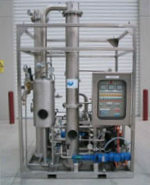 Originally the company’s product line was based on high airflow liquid ring vacuum tankers and air driven mining pumps, but over the last decade due to a change in environmental focus the company has moved towards specialist remediation equipment and final stage treatment of waste streams.